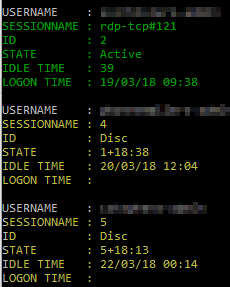 To fix this, we just need the script to identify all sessions where SESSIONNAME isn’t like “console” and not like “rdp-tcp*“. When this is the case (like in the yellow sessions in the screenshot above), then we need to shift the values and we’re done! So, SESSIONNAME will have to be empty, the ID will match SESSIONNAME, the STATE will match the ID and so on. 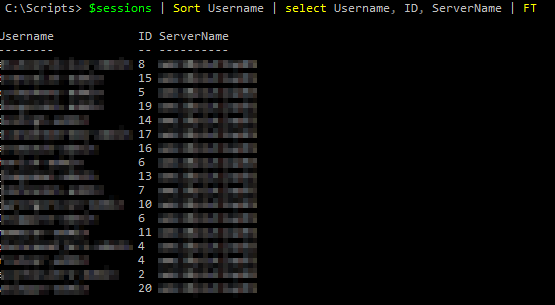 #Check if SESSIONNAME isn't like "console" and isn't like "rdp-tcp*"
That’s it on how to get a list of users logged on a list of servers. Impressive, this actually works well and is way more reliable/less hacky than many of the other solutions I’ve found on google!